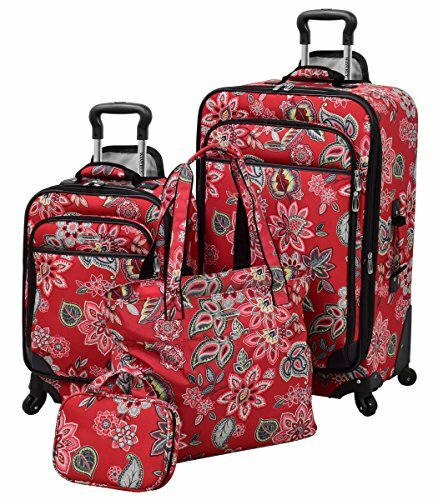 Fashionable and durable Waverly luggage set has both a carry on for your shorter trips and a larger spinner for your longer trips as well as two smaller pieces that make traveling convenient. It's available in fun fashionable prints and you'll be able to tell which bag is yours coming off the carousel. Durable printed polyester with accent trim. Locking hidden retractable push button handle system. Multi-directional 360 degree 4 wheel spinners on uprights. Lightweight design, upright features: interior has mesh pockets on lid, cargo straps keep all your packed items neatly stowed, EVA foam padded fronts, protective corner guards help keep case looking new, convenient top and side carry handles for easy lifting. If you have any questions about this product by Waverly, contact us by completing and submitting the form below. If you are looking for a specif part number, please include it with your message.